No, this isn’t the title of a sci-fi short story. This post is based on actual events. Here you will find a completely accurate and detailed account of what happened on the morning of June 16. Read at your own risk. It began like any other morning. My alarm went off and I hit snooze. Always a dangerous thing to do when I have to be somewhere at a designated time. I use my phone as my alarm and on more than one occasion the alarm somehow was turned off. I’m not sure how that happened. Halfway through my snooze time, I decided to just get up. What was 10 more minutes going to do for me anyway? I threw back the covers and swung my feet to the floor. After taking care of some necessary business, I found my computer to check my email. I try very hard to keep up on emails and blog comments. Today, my location of choice was sitting on the floor beside the bed. Focused on work, I heard a buzzing sound around my head. It didn’t register at first. It wasn’t until it dive-bombed at me that I realized there was a bug and I swatted without thinking. After the second or third swing of my hand, I thought maybe I should take a step back and assess the situation. I would hate to be swatting at a wasp or a bee, and both have made their way into my inner sanctum in the past. I pushed myself up and moved to the foot of the bed trying to determine what was buzzing around. Finally, I saw what looked like a huge fly. It was a horse fly. You might think at this point I would just kill it and it would be the end of the story. But stories don’t usually end so peacefully, and this one is no exception. I could have killed it, I suppose, but I don’t particularly care for killing things, even insects. Besides, it was enormous. I didn’t want to clean up the mess. I thought we could find a way to live together in peace. Besides, I needed to begin getting ready to leave. It could buzz around the bedroom for a bit and I would head to the bathroom. Everybody’s happy. Before long, it invaded the bathroom. 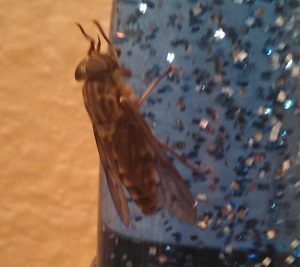 It buzzed in and perched itself on my lava lamp night light (don’t judge). OK. I can deal with that. He can stay on the lava lamp and I will continue getting ready. All is well. Except. Yep. You guessed it. It attacked! It flew at me again. This time, in the confined space of the bathroom, the attack seemed much worse than it actually was and forced me to flee screaming from the room. Make no mistake, the fleeing was accompanied with flailing arms and hands. Standing outside the bathroom and laughing at myself for my silliness and the entire situation, I decided it was safe to re-enter and finish getting ready. Though I was laughing (my reaction was seriously hysterical), I had to find a way to finish getting ready. I needed to leave and I was way behind schedule to get out the door on time. I braved the room again, but with a different mission in mind. I quickly gathered up my things and moved to the mirror in the bedroom. It could have the bathroom. I finally finished getting ready and shut the door on the entire situation. Literally. I shut the fly in the bedroom/bathroom and left. Honestly, it was not the fly I was shutting in, but my dog that I was shutting out. 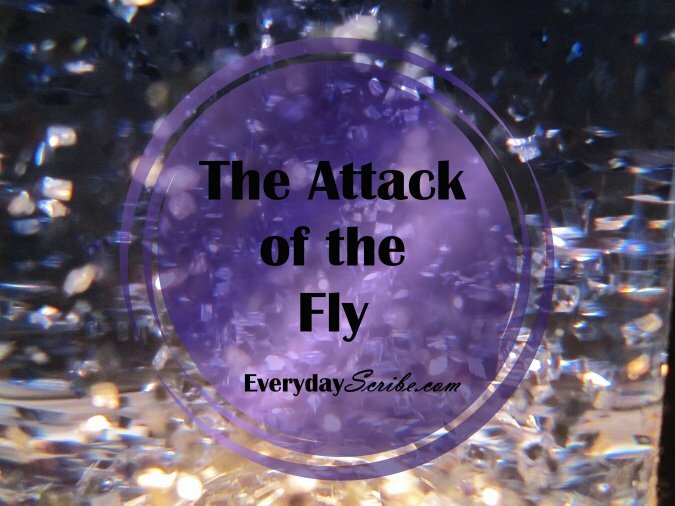 And, it proved fatal for the fly. I found it dead on the floor when I returned. I guess it just could not live without you. Ha! I didn’t think of it like that. Thanks, Kathleen! The first thing that caught my eye was the color of the circle. Then, I hoped your post was about Jeff Goldbloom! Seriously wonderful that you have a lava lamp night light!! HA! He got what he deserved!! I did think about adding a Jeff Goldbloom reference, but it just didn’t flow with the narrative. Ha! Thank you for stopping by and reading! Glad I could make you laugh.